We are five UNCW seniors producing a capstone narrative film to demonstrate all of our acquired skills and knowledge through the art form that is cinema! Our story is about two sisters, separated by a large age gap, coming together to mend their distant relationship before the elder sister heads off to college. In order to put this story on screen, and to create a film about the importance of family, we need your support! Your gift will help us purchase camera equipment, production design materials and a wide variety of props that we would need to help make our vision a reality. The main character, PJ, is an 11-year-old with an inventive imagination. We need to stock the set of her bedroom with props that help that story come to life. Props include books, radio speakers, sketchbooks, potato clock, holiday lights, cooking utensils, garden hose, cardboard tubes, towels, step stools, sticky notes, With a rigorous film schedule (6+ hours/day) and a minor on set as part of our cast, meeting our goal will also enable us to meet requirements on-set such as providing food. The making of this film is broken down into two parts. Pre-production/Production will take place beginning in November when we will shoot our film. Post-production will happen next semester when we will edit the film, adjust sound, color correction, etc. for our finished work! With only 30 days to reach our goal before filming starts, we need your help! Whether you're family, a fellow Seahawk, a friend or you have an interest in seeing future filmmakers succeed, your involvement is what will make this film something that we are truly proud to produce. Your contribution, no matter the amount, will help us reach the goal! With your gift, you're not just helping to make this film possible, you're providing an invaluable learning experience for everyone who is part of this project. Receive a special shout out from one of the filmmakers. 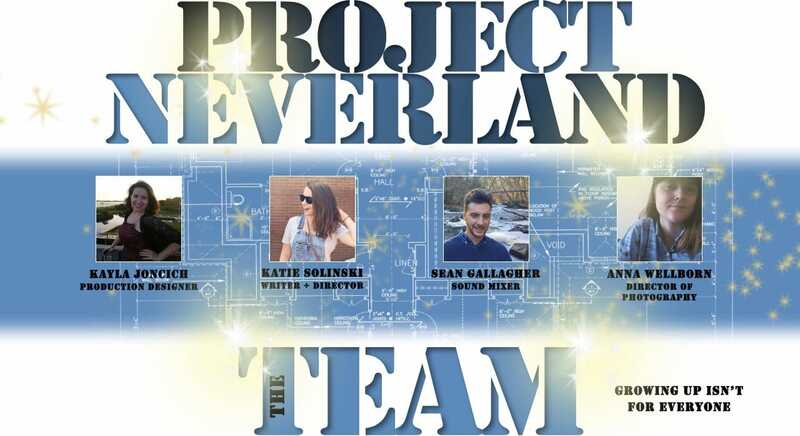 Your name will be listed in the "Special Thanks' section of the credits of Project Neverland as a special way to thank for your involvement in the creation of the film. Only four donors will earn this honor. Be among this special group of generous donors to the project with a gift of $250. Your contribution will earn you the title of Associate Producer and your name will appear in the credits of the film. With your contribution of $500, you will earn the title of Executive Producer. Hurry, there can only be three donors to earn this prestigious title. We look forward to showcasing your name in the credits of our completed work. We cannot do this without your support! Executive Producers will also be given early access to the completed film prior to its release.